Every 3-4 years most companies perform a tech refresh. This could be buying new desktops, buying new servers as well as upgrades to operating systems like Microsoft Server, Microsoft Windows, and other software like Microsoft Office. This is a large outlay of capital for most companies planned or not. What would you say if I could show you a way to never have pay for upgrades again? What if I could eliminate the costs and inconvenience of upgrading and the downtime it creates doing so? I can. Quasar Complete is a all-in-one solution for small business that includes the hardware for your desktops. 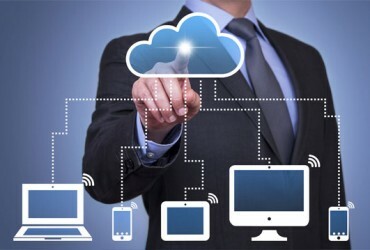 No more shopping for the best deals on Black Friday because Quasar Complete includes our Cloud-Connect device that replaces the office computer. 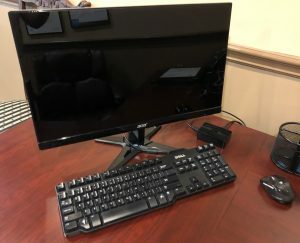 You just plug your existing keyboard, mouse and monitor into our Cloud-Connect device. Connect it to your network and you’re connected to your new cloud-based desktop. It functions exactly like your regular desktop except its robust, has the latest Microsoft desktop and Office 2016. Our Cloud-Connect device is that small box to the right on the desk. It can easily be hide behind the monitor or under the desk. No more bulky computers and you’ll find your server data right where it belongs. We have Office365 email services included with your new service as well. Another thing most owners don’t think about is where there business is located and how it affects them. Most small business lease in multi-tenant buildings. I had a client a few years ago who was locked out of their building by the city for six months because of a fire cause by a microwave two floors below them. Crazy but true. It disrupted their business considerably as they had to co-locate their servers at considerable cost in order to continue operations. Quasar Complete also protects you from Ransomware, Malware and Viruses as you entire business network; servers and desktops are backed up every hour automatically and mirrored to our Dallas data center. This means that no matter what a user does to your environment; intentional or not, your protected. We can revert any part of your environment back to before it was affected in minutes, not hours or days. Lastly, none of your data resides outside f the data center. This means if any laptop, desktop or tablets are stolen, lost or just fail to work; none of your data is at risk because nothing is stored on it. When you are using our solution, these devices allow you to remote control you desktop as if it was on the device without the risk involved with storing it on the device. Quasar complete include an integrated backup and disaster recovery system for your whole business environment with guaranteed 99.9% up-time. Our service level agreement (SLA) is guaranteed. We even provide 24/7/365 support from our own certified help desk for everyone in your office. We will get you out of the IT business and focused on your business, not ours. Do you want IT that just works? Then Quasar Complete is the answer. Message me below with a time we can spend 30 minutes with you to ask a few questions about your business. We will give you a proposal that will reduce your costs, improve your productivity and provide you a bullet-proof computing environment. Please talk to me before you spend a dime on hardware and software upgrades!. It too late after you spend the money!